This is to certify that Mr. JAI PRAKASH BHIMWAL has successfully completed the preliminary examination held on 13/06/2016 as required under the regulation for Doctor of Philosophy in Agriculture. This is to certify that this thesis entitled, “Effect of Herbicides and Nutrient Management on Productivity of Soybean [ Glycine max (L.) Merrill] and their Residual Effect on Succeeding Wheat (Triticum aestivum L.)” submitted for the degree of Doctor of Philosophy in Agriculture in the subject of Agronomy, embodies bonafide research work carried out by Mr. Jai Prakash Bhimwal under my guidance and supervision and that no part of this thesis has been submitted for any other degree. The assistance and help received during the course of investigation have been fully acknowledged. The draft of this thesis was also approved by the advisory committee on dated 14-02-2018. 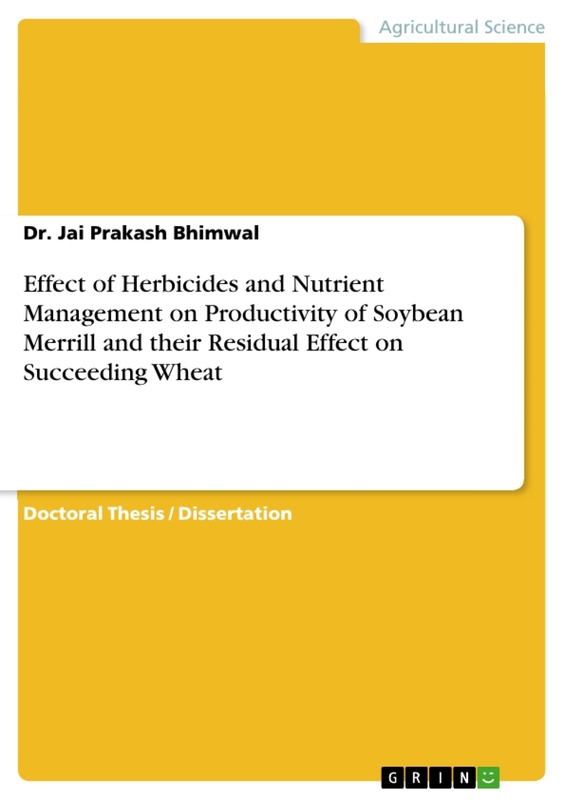 This is to certify that the thesis entitled “Effect of Herbicides and Nutrient Management on Productivity of Soybean [ Glycine max (L.) Merrill] and their Residual Effect on Succeeding Wheat (Triticum aestivum L.)” submitted by Mr Jai Prakash Bhimwal to Maharana Pratap University of Agriculture and Technology, Udaipur in partial fulfillment of the requirements for the degree of Doctor of Philosophy in Agriculture in the subject of Agronomy after recommendation by the external examiner was defended by the candidate before the following members of the examination committee. The performance of the candidate in the oral examination on his thesis has been found satisfactory; we therefore, recommend that the thesis be approved. This is to certify that Mr. Jai Prakash Bhimwal , student of Doctor of Philosophy in Agriculture, Department of Agronomy, Rajasthan College of Agriculture, Udaipur has made all corrections / modifications in the thesis entitled “Effect of Herbicides and Nutrient Management on Productivity of Soybean [ Glycine max (L.) Merrill] and their Residual Effect on Succeeding Wheat (Triticum aestivum L.)” , which were suggested by the external examiner and the advisory committee in the oral examination held on 28.05.2018. The final copies of the thesis duly bound and corrected were submitted on 29.05.2018 are enclosed herewith for approval. At this moment of accomplishment, first of all I take it to be my proud privilege to express my sincere and deep sense of gratitude and indebtedness to my learned advisor, Dr. Arvind Verma, Professor, Department of Agronomy for his engrossing guidance, incessant encouragement, constructive suggestions, propitious assistance, keen and sustained interest, kind and gracious patronage during the entire course of investigation and preparation of this manuscript. I am highly obliged and gratified to all the members of advisory committee, Dr. V. Nepalia, Professor (Agronomy), Dr. S.L. Mundra Professor (Agronomy), Dr. H.K. Jain Professor (Statistics & Computer Application), Dr. S.S. Sisodiya Professor, (Soil Science) & DRI Nominee, Rajasthan College of Agriculture, Udaipur for their generous gesture and critical suggestions in planning and execution of this study. It’s my fortune to gratefully acknowledge the support of Dr. V. Nepalia Professor and Head (Agronomy), Rajasthan College of Agriculture, Udaipur for his keen valuable guidance, regular support and inspiration during the experiment work. I would like to express my heartfelt gratitude to Dr. Arunabh Joshi, Dean and Dr. M.S. Swaminathan, Dr. Anila Doshi and Dr. S.R. Maloo Ex. Dean, Rajasthan College of Agriculture, Udaipur for providing necessary facilities and administrative help in this venture. Words fail to recognize the contribution of Dr. Dilip Singh, Dr. M.K. Kaushik, Dr. S.L. Mundra, Dr. N.S. Solanki, Dr. L.N. Dashora, Dr. J. Choudhary, Dr. R.S. Choudhary, Dr. Roshan Choudhary, Dr. H.K. Sumeriya, Shri K.S. Shaktawat and Shri Govendra Singh and other staff members of the Department of Agronomy for their kind cooperation in completing this investigation smoothly.  I owe my profound grateful to Ex. Faculty members Dr. Pushpendra Singh, Dr. G.L. Sharma and Dr. R.C. Tiwari for their kind and benevolent support during different stages of the study. I am highly thankful to Project Incharge, AICRP on Weed Management, Rajasthan College of Agriculture, Udaipur for providing necessary facilities to conduct field experiments, laboratory analysis and permitting me to record the observation for this study from the experiment of the project. I am indebted to my fellow Ph.D and PG scholars for providing a stimulating and fun filled environment. My thanks go in particular to Versha Gupta, Surendra Kumar Meena, Shravan Yadav, Dr. Vasudev Meena, Dr. V. Shetye, Dr. Vijay Sharma, Bhojraj Verma, Hemant Kumar, Rajendra Kumar, Sandhya Dhaka, Manoj Kumar Jangir and Harikesh Jat for their ever willing help and co-operation during the course of investigation. I cannot forget to give special thanks to DR. B. Tiwari sir, Dr. D. Bhatt sir and all student section staff. I feel short of words in expressing indebtedness and reverence to my caring parents Sh. Prabhu Dayal Bhimwal and Smt. Gulab Devi for their blessings, motivation and encouragement throughout the progression of educational pursuit. I have no words to express thanks to my wife Smt. Madhu and my daughter Pari for her calm and enduring support during the course of my doctoral studies and research. Last but not the least; I owe heartfelt debt to God who gave me an opportunity to reach on this stage. In the recent past, India has made an impressive progress in achieving self sufficiency in food grains. However, efforts to increase the production of oilseeds have not brought any perceptible change in per capita availability of oil to predominantly vegetarian population of our country. The domestic demand for vegetable oils and fats has also been rising rapidly at an increasing rate due to increase in per capita income and increase standard. The present per capita annual consumption of edible oil is 14.4 kg and in 2030 it will likely to be 19.1 kg (Kumar et al., 2016). India will continue to depend on imports of edible oils even in the coming decades. The domestic production of edible oils is projected to be about 12 million tonnes by 2020 and 19 million tonnes by 2030 (Kumar et al., 2016). These facts clearly emphasize urgent need to achieve substantial and sustained growth in production of oilseeds. Soybean [ Glycine max (L.) Merrill] is one of the most important oilseed crop in India. The crop is called “Golden bean” or “Miracle crop” of the 21st century because of its multiple uses (Jadhav, 2014). Soybean seeds contain 38-42 per cent good quality protein and 18-20 per cent oil, rich in polyunsaturated fatty acids (linoleic and oleic acid) along with a good amount of minerals (Ca, P, Mg, Fe and K) and vitamins especially B- complex and teco-pherols (Devi et al., 2012). It plays a pivotal role in meeting the continuously increasing demand of the edible oil across the world. Globally, the crop contributes about 25 per cent to the total edible oil production. The estimates of the world soybean area, production and productivity for 2015-16 are 118.01 m ha, 315.06 million tonnes and 2.67 t ha-1, respectively. India is the fourth and fifth largest country in the world with respect to soybean area and production, respectively. During the year 2015-16, soybean occupied an area of 11.67 m ha with production and productivity of 8.59 million tonnes and 737 kg ha-1, respectively (Agricultural Statistics, 2016). Out of the total area covered by this crop in country, Madhya Pradesh, Maharashtra and Rajasthan are the major contributing states that covered 50, 32 and 10 per cent area, respectively. Rajasthan occupies an area of 1.20 m ha with the production and productivity of 1.00 million tonnes and 829 kg ha-1 during 2015-16 (Agricultural Statistics, 2016). Though the area and production of soybean is increasing, the average productivity remained constant during the last decades even after development of high yielding varieties and dissemination of new technologies. One of the major constraints in soybean production is crop-weed competition (Vollmann et al., 2010). Yield reduction in soybean due to poor weed management ranges from 30 to 80 per cent depending on weed flora and their density (Gupta et al., 2006). Although, weeds pose problems during the entire crop period, but the first 30-45 days of the crops are the most critical (Singh et al., 2013). Hand weeding is a traditional and effective method of weed control, but unavailability of labour during peak period of demand and hindrance of crop for manual weeding due to unpredictable continuous rains in the growing period make weed management in soybean a challenging task while mechanical means generally leads to root injury (Lal et al., 2016). Under such situations weed management through the herbicide application remains the only viable option. Most of the herbicides available and used for controlling weeds in soybean are either pre-plant incorporated or pre-emergence ones. A number of herbicides are available but their suitability in view of weed species and spectrum of control by them in soybean ecosystem continues to perplex. Besides this, many weed species do not germinate at the planting time and germinate in the staggered manner in standing soybean crop. Sole application of herbicide as pre or post-emergence fails to control diversified and subsequent flushes of weeds effectively (Tuti and Das 2011). Moreover, continuous use of single herbicide is known to result in the evolution of resistance in weed species and shift in weed flora (Schutte et al., 2017). So, there is need to apply some new post-emergence herbicides and their tank mix combinations like imazethapyr, propaqizafop, quizalofp-ethyl and chlorimuron-ethyl to reduce weed menace and keep the crop free from weed competition during entire critical period of crop growth (Sandil et al., 2015; Parmar et al., 2016 and Nirala et al., 2016). Herbicide mixtures provide an opportunity for increasing weed control efficiency and arresting all complex weed flora shift. Compatible herbicides in the mixture at low rates do offer either additive or synergistic and enhancement effect in weed control which could be seen through an eco-friendly angle towards sustainable production. In most of the irrigated double cropped area, soybean is grown in rotation with wheat. The herbicides applied to soybean may leave the residual effect on succeeding wheat crop. But, the information on the residual effect of herbicides used in soybean on a succeeding wheat crop is meager (Jadhav, 2014). Among the growth inputs, mineral nutrition play a vital role not only in exploiting the realizable potential of the crop, but also to maintain sustainability of soil for agriculture production. Due emphasis on nutrition part is very essential. In recent years intensive cropping with imbalance fertilization has resulted into more and more removal of nutrients from the soil and severe strain on the soil system. Among the other rainy season crops, soybean is badly affected, by weeds. The depletion of nutrients by weeds was estimated around 71.5, 6.9 and 97.4 NPK kg ha-1, respectively (Chander et al., 2013). Poor control of weeds is one of reasons for lower fertilizer use efficiency. The nutrient loss can be minimized or fertilizer use efficiency can be improved by controlling weeds. In India, farmers generally use nitrogenous and phosphatic fertilizers in large extent. Unlike nitrogen and phosphorus, potassium and sulphur are the major essential nutrients required for growth and development of soybean. An adequate nutrition is one of the most important constraints of soybean productivity. The response of soybean to fertility is highly inconsistent, location specific and even site specific. Now it has been well realized that for sustaining crop productivity by weed management and maintaining soil fertility as well as by nutrient management are of utmost importance. i. To assess the bio-efficacy of herbicides and their combinations on weed dynamics. ii. To study the effect of herbicidal weed management on the growth and yield of soybean. iii. To determine the response of soybean to balanced fertilization. iv. To arrive at economically viable recommendation of treatments. v. To assess the residual effect of herbicides in succeeding wheat crop. 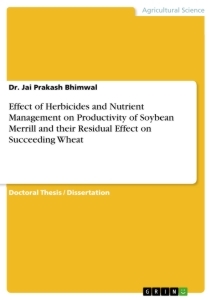 A brief review related to the research work done on “Effect of Herbicides and Nutrient Management on Productivity of Soybean [ Glycine max (L.) Merrill] and their Residual Effect on Succeeding Wheat (Triticum aestivum L.)” is presented in this chapter. To cover the paucity of literature on new post-emergence herbicides and herbicide mixture, research findings on others crops and crop rotations have also been presented to highlight the importance of these factors. Being a rainy season crop, weed competition in soybean is one of the most important causes of yield loss in kharif season where, grassy and broad leaf weeds compete with crop for essential nutrients, light, space and moisture. The yield loss varies between 35-80 per cent depending on the type of weed flora and density of weeds (Gupta et al., 2006). In various research and experimentation at different locations predominant monocot weed species associated with soybean were like Commelina benghalensis, Echinochloa colona, Echinochloa crussgalli, Setaria glauca, Dinebra arabica, Poa annua, Panicum dichotomiflorum, and Digitaria sanguinalis. The Predominant dicot weed species associated with soybean were Trianthema portulacastrum, Trianthema monogyna, Phylanthus niruri, Eclipta alba, Digera arvensis, Euphorbia hirta, Acalypha cilliata, Achyranthus aspera, Euphorbia geniculata, Alternanthera triandra, Merremia emarginata, butilon indicum, Tridex procumbense, Physalis minima, Parthenium hysterophorus, Corchorus spp., Celosia argentea, Amaranthus viridis, Alternanathera triandra , Alysicarpus rugosus and Aeschynomene spp. Soybean usually develops a full canopy cover at 8 weeks after emergence and can then compete with weeds up to maturity. Little or no reduction in yield occurs if soybean is kept weed free for the first 5 weeks which is the critical period for weed competition. Kushwah and Vyas (2006) at Sehore observed in a field experiment that infestation of soybean crop with weeds like Echinochloa colona, Cyperus rotundus, Digitaria sanguinalis, Commelina benghalensis etc. had reduced the seed yield up to 31.2 per cent when compared to imazethapyr at 75 g ha-1 applied as post emergence. Malik et al (2006) at Hisar, found that soybean crop infested with broad-leaved weeds (80 %) and grassy and sedges (20 %) throughout the crop season suffered yield reduction of 55 per cent. The study conducted on sandy loam soil at New Delhi, revealed that weeds including Trianthema portulacastrum (67 % weed density) offered severe competition to soybean crop and resulted in significantly lower seed yield than weed free. The uptake of nutrients (N, P and K) by soybean was also reduced due to the competition exerted by weeds (Hazra et al., 2009). According to Kundu et al. (2011) at Nadia (West Bengal), a weedy soybean crop produced 43.3 per cent lesser seed yield in comparison to a weed free crop. At Kota (Rajasthan), infestation of grassy weeds (51.6%), broad-leaved weeds (34.1%) and sedges (13.2%) throughout the growth period caused 57.2 per cent reduction in seed yield of soybean (Meena et al., 2011). Sanjay et al. (2011) conducted a field experiment on the sandy loam soil of Hebbal, Bangalore and observed that unweeded control lowered the soybean yield by 61 per cent mainly due to severe competition offered by grasses. They also concluded that soybean field must be kept weed free from 9 to 47 days after emergence. The experimental field was infested with Commelina benghalensis (43.36 and 57.87%), Echinochloa colona (18.04%), Aeschynomene indica (3.78%), Ageratum conyzoides (3.68%), Panicum dichotomiflorum (11.53%), Digitaria sanguinalis (4.25%), Eleusine indica (3.54%) and Cyperus spp. (9.21%). Weeds in unweeded check removed 71.5 kg of N, 6.9 kg of P and 97.4 kg of K (Chander et al., 2013). Singh et al. (2013) at Madhya Pradesh, Jabalpur observed that Echinochloa colona (22.6 %) was the most dominant weed followed by Dinebra retroflexa (18.7%) and Cyperus iria (17.0 %) among the monocot weed, while Eclipta alba (22.3%), and Alternanthera philoxeroides (19.2%) were dominant in dicot weeds in soybean ecosystem at 40 DAS. Further, the yield and yield attributes, viz. pods plant-1, seed yield and stover yield were significantly lower in weedy plot of soybean. Likewise gross and net returns were minimum in weedy check because of the lowest economic yield. At Pantnagar, major weed species in soybean field were Echinochloa colona (36.2%), Eleusine indica (76.6%), Dactyloctenium aegyptium (16.8%), Digitaria sanguinalis (19.5%) among grasses and Trianthma monogyna (54.0%), Commelina benghalensis (28.7%) and Phyllanthus niruri (17.4%) were dominant among non-grasses. Reduction in grain yield due to uncontrolled weeds was recorded to be 61.82 per cent (Singh et al.,2014). At same location Jha et al. (2014) showed that compared to weed free crop, presence of uninterrupted weeds (weedy check) accounted for 73.8 per cent reduction in soybean seed yield. A hoe weeded control tended to give 75 per cent more soybean yield over weedy check in Nigeria (Chikoye et al., 2014). At Udaipur, a weedy soybean crop could produce only 521 kg ha-1 of seed yield as against 1421 kg ha-1 without weeds, showing 63.3 per cent reduction in yield due to uncontrolled weeds (Sharma, 2015). Similarly, Prachand et al. (2015) at Akola reported that the grain yield reduction due to heavy weed infestation in soybean was 60 per cent and uptake of N, P and K was significantly lower in unweeded soybean. The weed density averaged over two seasons revealed that grassy weeds (76.25%) were dominant in soybean compared to non-grassy weeds (23.75%) and yield reduction due to presence of weeds in soybean was maximum (63.1%) in weedy plots (Panda et al., 2015). The field of soybean at Jabalpur, Madhya Pradesh was infested with monocot weeds like Echinochloa colona and Cyperus iria whereas dicot weeds Alternanthera philoxiroides, Eclipta alba, Commelina benghalensis and Phyllanthus niruri were less dominant in soybean. Weedy check treatment produced significantly lowest seed yield (10.9 qt ha-1) which was 59.96 per cent lower than weed free treatments (Saharan et al., 2016). Two hand weedings at 20 and 40 DAS in soybean significantly reduced total density and weed biomass and produced the highest soybean grain yield compared to all other weed control treatments (Kushwah and Vyas, 2006). Singh et al. (2007) reported that one hand weeding at 20 DAS in soybean resulted in significantly higher pods plant‑1 (30.2) and seed yield (10.65 q ha-1) compared to weedy check (8.1 pods plant‑1 and 3.70 q ha-1 seed yield). Kumar et al. (2008) in a study at Palampur observed that hand weeding twice at 30 and 60 DAS in soybean significantly reduced weed dry matter and recorded the highest weed control efficiency (86.8 %) compared to all other weed control treatments. They further reported significant increase in branches plant-1, pods plant-1, test weight and seed yield compared to weedy check. At IARI, New Delhi it was found two hand weeding at 3 and 5 weeks after sowing in soybean resulted in significantly higher branches plant-1 (3.6), seeds pod-1 (3.2), test weight (95.0 g) and seed yield (16.0 q ha-1) over control where the corresponding values of these parameters are 2.9 2.1, 89.5 and 11.5, respectively (Kumar and Das, 2008). In A study at Sehore Vyas and Kushwah (2008) reported that two hand weedings at 20 and 45 DAS in soybean significantly increased plant height (74.3 cm), branches palnt‑1 (3.0), pods plant‑1 (40.8) and seed yield (15.1 q ha-1) compared to rest of the weed control treatments under test. Priya et al. (2009) in an experiment at Coimbatore (Tamil Nadu) found that two hand weeding (20 and 35 DAS) recorded the lowest weed dry matter of 306.3 kg ha-1 compared to the highest (964.0 kg ha-1) recorded under weedy check. They further reported that seed protein content and seed oil content were not influenced due to different weed control treatments in soybean. Benke et al (2011) in a field experiment at Nagpur, recorded that two hoeing and weeding at 20 and 40 DAS gave significant higher yield than that in rest of the weed control treatments in soybean. In an experiment at Kota, Meena et al (2011) reported that the maximum seed yield of soybean (1075 kg ha-1) and weed control efficiency of grasses (86.9 %), broad leaf (88.4%) and sedges (73.0 %) were obtained with two hand weeding at 20 and 40 DAS closely followed by imazethapyr 150 g ha-1 (957 kg ha-1). They also observed that the lowest weed density and its dry weight at 60 DAS were recorded with hand weeding twice. At GKVK Bengaluru, Habimana et al. (2013) found that among the weed control treatments, significantly lower total weed density was recorded at harvest under inter-cultivation followed by two hand weeding at 20 and 40 DAS (8.00 per 0.25 m2) and remained at par with metribuzin at 0.5 kg ha-1 at 3 DAS followed by imazethapyr at 100 g ha-1 at 20 DAS (8.67 per 0.25 m2). Similarly, significantly lower total weed dry weights (1.00 g 0.25 m2) as well as more than 96 per cent weed control efficiency was recorded in inter-cultivation followed by two hand weeding. It registered higher soybean grain yield (2570 kg ha-1), haulm yield (2964 kg ha-1) and higher net return (Abbildung in dieser Leseprobe nicht enthalten49,652 ha-1) which remained at par with metribuzin followed by imazethapyr (2497 kg ha-1, 2867 kg ha-1and Abbildung in dieser Leseprobe nicht enthalten49,013 ha-1, respectively). Jha et al. (2014) at Pantnagar during kharif reported that the weed free check in soybean was found the best in terms of the highest nodulation, yield and yield attributes, N uptake and soil parameters. The highest net return of Abbildung in dieser Leseprobe nicht enthalten39,563 ha-1 was obtained in soybean with weed free check, which was at par with application of imazethapyr 100 g ha-1 and clodinafop-propargyl + sodium-aciflurofen 100 + 206.2 g ha-1. At Udaipur weed free, pre-emergence application of pendimethalin 750 g ha-1 + hand weeding at 30 DAS, two hand weeding treatment increased N and P uptake by soybean to the tune of 174.8, 163.6, 152.1 and 177.1, 166.5, 156.9 per cent, respectively over weedy check (Sharma et al., 2016). Pre-emergence application of pendimethalin at 0.45 kg ha-1 + hand weeding at 30 DAS resulted in significant reduction of weed dry matter (94.9 %) with coupled 73.5 per cent increase in soybean seed yield over weedy check (1910 kg ha-1) at Ludhiana (Singh, 2007). Singh et al. (2009) observed in two successive years of study at Pantnagar (Uttrakhand) that pre-emergence application of pendimethalin at 1.0 kg ha-1 in soybean crop gave 67.1 and 71.8 per cent control of weeds with concomitant increase of 89.6 and 87.7 per cent in crop seed yield over weedy check during the respective two seasons. On a red sandy loam of Bhavanisagar (Tamil Nadu), pre-emergence application of pendimethalin at 750 g ha-1 in soybean recorded significant reduction in total weed biomass and weed control efficiencies of 80.3 and 94.4 per cent at 30 and 60 DAS, respectively and thus, significantly increased the seed yield from 0.83 (under weedy check) to 1.48 t ha-1 (Sangeetha et al., 2013). Sudhakara et al. (2013) conducted a field experiment on the medium fertile soil, having sandy loam texture with slightly acidic reaction (pH 5.6) at Bangaluru (Karnataka) and found that application of pendimethalin at 1000 g ha-1 in soybean crop significantly reduced the weed count and dry matter (48.0 and 51.1 per cent, respectively) over weedy check. Thereby the seed yield of soybean from 12.2 (weedy check) to 19.9 q ha-1. On the sandy loam soil at New Delhi with pH 7.6, pre-emergence application of pendhimethalin at 0.75 kg ha-1 + hand weeding at 30 DAS reduced weed count by 78.5 per cent and dry matter by 51.3 per cent. This was accompanied by increased yield of soybean to the tune of 1.79 t ha-1 which was 84.5 per cent more than weedy control (Younesabadi et al., 2013). Amaregouda et al. (2013) at Dharwad (Karnataka) found that pre-emergence application of pendimethalin at 1350.5 g ha-1 resulted in 87.6 per cent weed control efficiency. This herbicide treatment significantly improved yield components like number of pods plant-1, number of seeds plant-1 and 100-seed weight, resulting in increase of soybean seed yield from 695 kg ha-1 (under weedy check) to 1958 kg ha-1. At Karad, Satara (Maharashtra) Jadhav (2013) observed that pre-emergence application of pendimethalin at 1.0 kg ha-1 and its integration with hand weeding at 30 DAS recorded 30.6 and 41.4 per cent reduction in weed biomass in comparison to weedy check (1047 kg ha-1). The soybean seed yield increased from 1.9 t ha-1 (under weedy check) to 2.35 and 3.08 t ha-1, respectively. On clay loam soil of Jabalpur (M.P.) Jha and Soni (2013) reported that application of pendimethalin at 1.0 kg ha-1 PE recorded 48.5 and 53.9 per cent weed control efficiency during two successive years of study. Compared to weedy check (0.84 and 0.88 t ha-1), weed control through pendimethalin gave 1.22 and 1.25 t ha-1 of soybean seed yield during their two respective years of experimentation. On the basis of field trials at Ludhiana, Bathinda and Kapurthala, in Punjab it was concluded that pre-emergence application of pendimethalin at 0.45 kg ha-1 followed by hand weeding at 40 DAS resulted in 75.4 per cent reduction in weed biomass with 69.5 per cent increase in soybean seed yield (Ram et al., 2013). In a study at Akola (Maharashtra) Prachand et al. (2014) found that pendimethalin at 1.0 kg ha-1 as pre-emergence resulted in weed control efficiency of 51.4 per cent which resulted in more number of pods plant-1 (40.67) compared to weedy check (26.0). As a result the crop yield increased from 9.77 q ha-1 (under weedy check) to 22.75 q ha-1, straw yield from 12.72 q ha-1 (under weedy check) to 31.46 q ha-1 and net return from Abbildung in dieser Leseprobe nicht enthalten9999 ha-1 (under weedy check) toAbbildung in dieser Leseprobe nicht enthalten51881 ha-1. On the salty clay loam soil of Kashmir, pre-emergence application of pendimethalin at 1 kg ha-1 + HW at 35 DAS resulted in significantly higher branches plant-1, pods plant-1, seeds pod-1 and 100-seed weight of soybean during two successive years of study. The net resultant was 46.8 and 52.7 per cent increase in soybean seed yield over weedy check (15.97 and 15.74 q ha-1) during two respective years (Peer et al., 2014). On the slightly alkaline sandy loam (pH 7.6) of New Delhi, Monsefi et al. (2014) observed that pre-emergence application of pendimethalin at 0.75 kg ha-1 followed by hand weeding at 25 DAS, the weed count and dry weight at 60 DAS reduced from 64 and 151.9 g m-2 (under weedy check) to 25 and 9.5 g m-2, respectively. Consequently the soybean seed yield increased from 1.84 to 2.18 t ha-1. In another study at the same location, Ali and Behera (2014) found that soybean crop treated with pendimethalin at 0.75 kg ha-1 (PE) produced 13.7 per cent more grain yield over control (1847 kg ha-1). At Raipur (Chhatisgarh), Gupta et al. (2014) found that pre-emergence application of pendimethalin at 1.0 kg ha-1 resulted 51.4 per cent weed control efficiency. The seed yield of soybean increased from 1232 kg ha-1 (under weedy check) by 25.6 per cent due to weed control through pendimethalin. In a study conducted at Akola (Maharashtra), pre-emergence pendimethalin at 1.0 kg ha-1 reduced the density of monocot, sedges and dicot weeds by 55.4 and 55.4 per cent with overall 55.4 per cent weed control efficiency. The soybean yield increased from 9.56 q ha-1 (under weedy check) to 19.16 q ha-1 by this treatment (Thakare et al., 2015). Tuti et al. (2015) at New Delhi revealed that pre-emergence application of pendimethalin at 0.75 kg ha-1 tended to increase soybean seed yield from 0.85 and 0.88 t ha-1 (under weedy check) to 1.33 and 1.24 t ha-1 during two years in a row. On the basis of one-year field experiment at Udaipur, Sharma et al. (2016) observed that pre-emergence application of pendimethalin 750 g ha-1 + hand weeding at 30 DAS recorded the maximum seed yield (1.38 t ha-1) along with the highest net returns and B: C ratio of Abbildung in dieser Leseprobe nicht enthalten27244 ha-1 and 2.32, respectively in soybean. At Rahuri, (Maharashtra) pendimethalin 0.75 kg ha-1 followed by one hand weeding at 30 DAS and pendimethalin 0.75 kg ha-1 followed by tank-mix application of imazethapyr + propaquizafop (80 + 60 g ha-1 ) at 25 DAS recorded the highest weed control efficiency of 89 and 88 per cent, respectively at harvest in soybean (Nagre et al., 2017). At Jabalpur (M.P. ), application of imazethapyr at 75 g ha-1 in soybean at 21 DAS caused significant reduction in weed biomass (52.9 %) and thus, significantly increased seed and straw yields by 86.0 and 40.5 per cent, respectively over weedy check (Tiwari et al., 2006). In another experiment at the same location, Dixit and Varshney (2007) found that post-emergence application of imazethapyr at 100 g ha-1 reduced weed density (39.8 and 3.3 %) and biomass (67.3 and 18.7 %) compared to weedy check during two consecutive years. Compared to weedy check (779 kg ha-1), the mean increase in seed yield due to this treatment was 40.3 per cent. Early post-emergence application of imazethapyr at 100-200 g ha-1 significantly reduced weed density and dry weight and increased soybean seed yield in western Maharashtra (Deore et al., 2007). Field experiment at Jabalpur (Madhya Pradesh) discovered that imazethapyr at 75 g ha-1 in soybean at 21 DAS brought about a significant reduction in weed biomass (52 per cent). This treatment significantly increased pods plant- 1, seeds pod-1 and seed and straw yields (61.8 and 58.4%, respectively) compared to weedy check (Tiwari et al., 2007). In a study at New Delhi, Kumar and Das (2008) observed that application of imazethapyr at 75 g ha-1 at 20 DAS in soybean resulted in significant dropdown in weed density and weed biomass (10 weeds m-2 and 6.3 g m-2, respectively) in comparison to weedy check (14.65 weeds m-2 and 11.7 g m-2, respectively). They further reported a significant increase in branches plant-1, seeds pod-1 and test weight, resulting in 19.8 per cent increase in soybean seed yield over weedy check. At Udaipur (Rajasthan), in comparison to unweeded control with weed density of 19.50 g m-2 and crop seed yield of 13.84 q ha-1, post-emergence application of imazethapyr at 100 g ha-1 in soybean reduced weed count by 54.2 per cent and increased seed yield by 34.0 per cent (Gaur and Kumawat, 2008). Shete et al. (2008) at Rahuri (Maharashtra) found that post-emergence application of imazethapyr at 87.5 g ha-1 in soybean recorded the lowest dry matter of weeds (3.27 q ha-1) and highest weed control efficiency 85.7 per cent. They further reported that seed yield of soybean (27.19 q ha-1) obtained under this treatment which was at par with two hands weeding (28.35 q ha-1) and was significantly superior to weedy check. Singh and Kumar (2008) in a field experiment at Kota (Rajasthan) found that application of imazethapyr at 75 g ha-1 as post-emergence significantly reduced weed dry matter at 30 and 60 DAS (85.7 and 71.0 per cent). They further reported 103.2 per cent increase in soybean yield compared to weedy check (9.50 q ha-1). Results of sixty field demonstrations to standardize herbicidal weed control technology in Sahapura block of Jabalpur (M.P.) revealed that imazethapyr at 100 g ha-1 gave 93 per cent control of weeds with 98.8 per cent enhancement in soybean yield over farmer’s practice of weed control (Singh, 2009). Application of 75 g ha-1 imazethapyr at 15 DAS followed by hoeing at 30 DAS resulted in significantly higher number of pods plant-1, number of seeds plant-1, and 100-seed weight in soybean. The treatment recorded significantly higher seed and straw yields (39.0 and 31.2 %) compared to the weedy control (Yadav and Shaikh, 2009). Shaikh et al. (2010) in a field experiment at Rahuri (Maharashtra) reported that application of imazethapyr at 75 g ha-1 early post-emergence resulted significant increase in seed and straw yields of soybean (32.04 and 44.84 q ha-1, respectively) in comparison to weedy check (19.56 and 30.84 q ha-1). At Bhavanisagar (Tamil Nadu), imazethapyr at 100 and 200 g ha-1 applied at 15 DAS provided 87 to 91 per cent weed control efficiency compared to unweeded control. However, imazethapyr at 200 g ha-1 exhibited slight phytotoxicity on soybean plants in the initial stages. Higher seed yield (1645 kg ha-1) was obtained with the application of imazethapyr at 100 g ha-1 (Sangeetha et al., 2011). At Gwalior, Pachauri et al. (2011) found that weed control by imazethapyr at 100 g ha-1 applied at 20 DAS gave 114.2 per cent higher seed yield of soybean in comparison to weedy check (618 kg ha-1). Consequently, the net returns increased from Abbildung in dieser Leseprobe nicht enthalten6549 ha-1 (under weedy check) toAbbildung in dieser Leseprobe nicht enthalten20694 ha-1, controlling weeds through imazethapyr. On the sandy clay loam soil, neutral in reaction at Jabalpur, application of imazethapyr at 100 g ha-1 in soybean caused significant reduction in weed biomass (70.0 and 87.9 % ) at 40 DAS and at harvest, respectively) and thus, significantly increased seed and straw yields (75.2 and 63.8 %, respectively) compared to weedy check (Upadhyay et al., 2012). Basu and Sengupta (2012) conducted a field experiment in West Bengal to check the efficacy of the herbicide imazethapyr in soybean with four variable rates of applications (750, 1000, 1250 and 1500 ml ha-1, respectively) and found that imazethapyr at 1500 ml ha-1 as post emergence effectively controlled all types of weeds of soybean such as grasses, sedges and broadleaved weeds and produced the lowest weed density (93.67 m-2 at 60 DAS), weed biomass (22.67 g m-2) and ultimately produced higher grain yield (2.17 t ha-1) and cost benefit ratio. At Jabalpur, compared to weedy check (11.5 q ha-1), weed control through imazethapyr at 100 g ha-1 with adjuvant 1000 ml ha-1 as PoE resulted in 34.8 per cent increase in soybean seed yield (Mishra et al., 2013). On the sandy loam soil of Jabalpur, Bharti et al. (2014) found that application of post-emergence imazethapyr at 100 g ha-1 resulted in significant increase in plant height (9.7 %) and number of branches plant-1 (24.6 %) compared to weedy check. The seed yield of soybean also increased from 1250 (under weedy check) to 2194 kg ha-1. At Raipur (Chattisgarh), application of imazethapyr as post-emergence at 100 g ha-1 resulted in weed control efficiency of 84.8 per cent. Concurrently the seed and straw yields of soybean increased by 54.7 and 45.5 per cent, respectivelly due to weed control through imazethapyr (Gupta et al., 2014). In a study at the Breeder Seed Production Unit, JNKVV, Jabalpur, where Cyperus rotundus, Eleusine indica and Digitaria senguinalis among narrow-leaved and Eclipta alba and Portulaca oleracea among dicot were dominating weeds, early post-emergence application of imazethapyr at 100 g ha-1 + adjuvant at 750 ml ha-1 + ammonium sulphate at one kg ha-1 gave excellent control of weeds (83.65 and 92.%) at 40 DAS and at harvest resulting in production of 2353 kg ha-1 of soybean seed yield which was 200.7 per cent more than weedy check (Kumar et al., 2014). In an another field experiment in soybean, Dhaker et al. ( 2015) at Udaipur found that post-emergence (20 DAS) application of imazethapyr at 100 g ha-1 + hoeing & weeding at 40 DAS recorded significantly higher seed yield (1395 kg ha-1) that was 195.7 per cent more than weedy check. In Ontario, Canada, imazethapyr at 104 g ha-1 resulted 95 per cent soybean seed yield over weed free condition (Walsh et al., 2015). An experiment conducted by Lal et al. (2016) at ICAR-Directorate of Weed Research, Jabalpur during kharif season of 2015 and 2016 in order to assess the energy budgeting of weed management in soybean cultivation and found that sequential application of pendimethalin 750 g ha-1 PE fb imazethapyr 100 g ha-1 at 20 DAS was found to be the most energy efficient weed management strategy and had maximum value of total output energy (71.90 x 103 MJ ha-1) and net energy returns (62.32 x 103 MJ ha-1). Other parameters like energy ratio (7.50), energy profitability (6.50) and human energy profitability (164.27) were also higher under the same treatment whereas, it recorded less specific energy (11.53 103 MJ ha-1) and energy intensity (0.48). At Jabalpur (Madhya Pradesh), application of quizalofop-ethyl at 50 g ha-1 in soybean was most effective in reducing weed density and weed biomass (37.7 and 59.7 %, respectively) compared to weedy check. It was further found that compared to untreated control (779 kg ha-1), application this weed control treatment increased soybean seed yield by 35.3 per cent (Dixit and Varshney, 2007). A study conducted by Pandey et al. (2007) at National Research Centre for Soybean (Now ICAR- Directorate of Soyban Research), Indore (Madhya Pradesh) and revealed that post-emergence application of quizalofop-ethyl at 50 g ha-1 was significantly effective in reducing growth of grassy weeds in soybean field. In a field experiment at Kota, predominant weed flora that invaded crop during growing season were Celosia argentia, Commelina benghalensis, Echinochloa colona, Echinochloa crusgalli, Cynodon dactylon, Digera arvensis and Euphorbia hirta. Application of quizalofop-ethyl at 50 g ha-1 PoE significantly reduced weed density and dry weight at 30 and 60 DAS. Compared to unweeded control (47.9 cm, 5.7, 2.2 and 1626 kg ha-1), the plant height, branches plant-1, seeds pod-1 and seed yield increased by 17.7, 35.0, 31.8 and 14.4 per cent , respectively by quizalofop (Meena et al., 2009). Benke et al. (2011) investigated at Nagpur (Maharashtra) and revealed that application of quizalofop-ethyl at 62.5 g ha-1 at 20 DAS followed by one hoeing at 20 days after spray recorded significantly higher yield of soybean. Field experiment at Bailhongal (Karnataka) showed that application of quizalofop-ethyl at 75 g ha-1 as PoE (21 DAS) raised the soybean seed yield from 18.78 q ha-1 (under weedy check) to 23.39 q ha-1 by controlling weeds by 87.6 per cent (Vijayalaxmi et al., 2012). Billore (2014) conducted a field experiment at ICAR-Directorate of Soybean Research, Indore and found that post-emergence application of quizalofop-ethyl at 45 g ha-1 resulted in 96.2 and 91.5 per cent weed control efficiency at 30 and 45 DAS, respectively. However, sedges and broad-leaved weeds remained unaffected by quizalofop-ethyl application. Simultaneously, the seed yield of soybean increased from 857 kg ha-1 (under weedy check) to 1262 kg ha-1 due to weed control through quizalofop-ethyl. At Dhule (Maharashtra), post-emergence (15 DAS) application of quizalofop-p-ethyl at 100 g ha-1 in soybean field resulted in 75, 54 and 42.2 per cent control of weeds at 30, 60 DAS and at harvest, resulting in crop seed yield enhancement from 1.52 t ha-1 (under weedy condition) to 2.62 t ha-1. It was further reported that when herbicidal application was followed by hand weeding at 30 DAS, the weed control efficiency increased up to 79, 78 and 78 per cent at 30, 60 DAS and at harvest with 3.01 t ha-1 of soybean seed yield (Patil et al., 2014). Jain and Meshram (2014) at Tikamgarh (Madhya Pradesh) registered that post-emergence application of quizalofop-ethyl at 50 g ha-1 at 20 DAS followed by hand hoeing at 40 DAS resulted in 78.4 per cent weed control efficiency along with soybean seed yield increase from 0.739 t ha-1 (under weedy check) to 1.732 t ha-1. On new alluvial soil (inceptisol) of Nadia (West Bengal), post-emergence application of quizalofop-p-ethyl at 37.5 g ha-1 at 16 DAS significantly reduced the number of broad-leaved, grassy and sedge weeds. This resulted in significant enhancement in growth attributes viz. LAI and crop dry matter at 30, 45 and 60 DAS. As a result the seed yield of green gram increased from 460 kg ha-1 (under weedy check) to 62.6 per cent (Tamang et al., 2015). Patel et al. (2017) conducted a field experiment on medium black calcareous clayey soil at Junagadh, Gujarat during three seasons of 2011-12, 2012-13 and 2014-15 and revealed that quizalofop-ethyl 40 g ha-1 as post-emergence (PoE) at 20 days after seeding (DAS) + hand weeding (HW) at 40 days after seeding (DAS) were most effective in controlling weeds and improving growth and yield attributes and ultimately seed and straw yield (1.14 and 1.26 t ha-1) of green gram. This treatments also recorded higher weed control efficiency (65.3 %), lower weed index (9.1 %) and minimum weed dry biomass (273.9 kg ha-1) and higher net returns (Abbildung in dieser Leseprobe nicht enthalten21,230 ha-1). Singh et al. (2004) in a field experiment at Pantnagar noted that chlorimuron- ethyl at various doses (6, 9 and 18 g ha-1) were effective on non-grassy weeds in soybean without causing any crop phytotoxicity. Seed yield due to chlorimuron-ethyl at 9 g ha-1 applied at 3 or 7 DAS were at par with the weed free control. Behera et al. (2005) reported that the pre-emergence application of chlorimuron-ethyl 9 g ha-1 and combined use of chlorimuron-ethyl and metalachlor 9g ha-1 and 1.0 kg ha-1 respectively, were equally effective in controlling the weeds and influencing soybean yield favourably. Pathak (2007) noted that combined application of quizalofop-ethyl 50 g + chlorimuron-ethyl 9 g ha-1 fetched the highest, B:C ratio (2.26), whereas, it was minimum (1.7) under weedy check plots in soybean. In a field experiment Sharma et al. (2008) found that among different weed control measures in soybean, grain yield and weed control efficiency were highest with quizalofop-ethyl at 50 g ha-1 + chlorimuron-ethyl at 9 g ha-1 as post-emergence application. Kramer et al. (2012) at Canada, reported that chlorimuron-ethyl 9 g ha-1 recorded the lowest density and biomass of total weeds and shown highest grain yield of soybean (2.66 t ha-1) than rest of weed control treatments. At Tikamgarh, Madhya Pradesh Parmar et al. (2016) conducted a field experiment and observed that chlorimuron-ethyl 9 g ha-1 at 20 DAS reduced significantly weed density and weed biomass and recorded higher seed yield (742 kg ha-1) and net monetory return over weedy check and the highest benefit : cost ratio (2.35) over rest of weed control treatments in soybean. In a field experiment at Jabalpur, Madhya Pradesh, Saharan et al. (2016) found that the application of chlorimuron-ethyl 24 g ha-1 as early post-emergence along with mechanical weeding was the most effective in paralyzing the weed growth to that of chlorimuron-ethyl (12, 24, 36, 48 and 72 g ha-1) and mechanical weeding at 20 DAS. The application of chlorimuron - ethyl at 24 g ha-1 as early post-emergence along with mechanical weeding was significantly superior for growth parameters, yield attributes and seed yield (1.61 g ha-1) of soybean than rest of the treatments without any phytotoxicity on soybean plants and was found more remunerative in terms of NMR (Abbildung in dieser Leseprobe nicht enthalten20024) and B: C ratio (2.06). Pradhan et al. (2010) at IGKVV, Raipur found that the post-emergence application of imazethapyr 80 g ha-1 + propaquizafop 60 g ha-1 in soybean resulted in the highest weed control efficiency (83.69 %) with highest grain yield (1870 kg ha-1). In the contrary of field experiment it was observed that among herbicidal treatments, plots treated with sequential application of metribuzin at 250 g ha-1 followed by propaquizafop at 50 g ha-1 at 3 weeks after sowing gave better performance of crop which was at par with sequential application of pendimethalin at 250 g ha-1 followed by propaquizafop at 50 g ha-1 at 3 DAS (Renjith and Sharma, 2014). A field experiment was carried out on the silty clay soil at Rahuri (Maharastra) during kharif 2013-14 and observed that one hoeing at 15 DAS and two hand weeding at 25 and 45 DAS was found the best treatment in respect of growth and yield attributing character in black gram. The weed dry matter and intensity was also the lowest in one hoeing at 15 DAS and two hand weeding at 25 and 45 DAS, which was followed by metribuzin at 525 g ha-1 followed by imazethapyr + propaquizafop-ethyl as post-emergence at 20 DAS at 80 + 60 g ha-1 (Patel et al., 2016). Ramprakash et al. (2016) concluded a study at Rajendranagar (Hyderabad) and found that propaquizafop did not adversely influence the soil properties when used as post-emergence herbicide for control of grassy weeds in turmeric and application of propaquizafop 62.5 g ha-1 resulted in highest bio-efficiency and persisted up to 45 days after application in soil beyond which the residues reached the BDL (0.01 mg kg -1). Recovery of the herbicide in soil varied between 91.8-92.6 per cent. In the rhizome and plant, the recovery was 88.6-92.1 and 93.6-93.8 per cent, respectively. At Rahuri, Nagre et al. (2017) reported that pendimethalin at 0.75 kg ha-1 followed by tank mix imazethapyr + propaquizafop (80 + 60 g ha-1) at 25 DAS recorded significantly highest grain yield (2.2 t ha-1), straw yield (2.7 t ha-1) net monetary returns (Abbildung in dieser Leseprobe nicht enthalten44362 ha-1) and B: C Ratio (2.21) in soybean. Meena et al. (2009) at Agricultural Research Station, Kota, conducted field experiment and reported that application of quizalofop-ethyl 50 g ha-1 + chlorimuron-ethyl 9 g ha-1 as post-emergence in soybean significantly reduced weed density (66 no. m-2), dry weight (16.2 g m-2) and weed control efficiency (83.9 %) at 60 DAS and recorded higher seed (1930 kg ha-1), straw yield (2584 kg ha-1), as compared to rest of the herbicidal treatments. On clay soil of IGKVV, Raipur (Chhattisgarh) it was observed that combined application of imazethapyr + fenoxaprop-p-ethyl (80 + 60 g ha-1) showed significantly higher weed control efficiency (79.54%), seed (1870 kg ha-1) and straw yield (4186 kg ha-1) over weedy check in soybean (Pradhan et al., 2010). Sanjay et al. (2011) conducted a field experiment on soybean during kharif 2007 and summer 2008 on sandy loam soil of Hebbal, Bangalore and found that tank mix combination of chlorimuron-ethyl 9 g + quizalofop-p-tefuryl 40 g ha-1 at 20 DAS with surfactant (1598 kg ha-1) or without surfactant (1518 kg ha-1) gave seed yield similar to hand weeding twice (1720 kg ha-1), as result of good control of grasses, broad leaf weeds and sedges. Unweeded control lowered the yield by 61 per cent mainly due to severe competition offered by grasses. Vijaylaxmi et al. (2012) conducted a field experiment and the study revealed that sequential application of oxyfluorfen 0.1 kg ha-1 fb imazethapyr 75 g ha-1 or diclosulam 22g ha-1 fb imazethapyr 75 g ha-1 recorded significantly higher seed yield (27.21 q ha-1), net returns (41030 Abbildung in dieser Leseprobe nicht enthalten ha-1) and BC (3.18) ratio besides effective control of weeds. In a field experiment at GKVK, Bengaluru, Habimana et al. (2013) found that metribuzin (0.5 kg ha-1) at 3 DAS followed by imazethapyr (100 g ha-1) at 20 DAS recorded lower biomass and density of weed and registered higher grain yield (2497 kg ha-1), haulm yield (2867 kg ha-1), and higher net returns (49013 Abbildung in dieser Leseprobe nicht enthaltenha-1). An agronomic investigation for weed control in soybean was conducted at Akola found that application of imazethapyr at 0.100 kg ha-1 + quizalofop - ethyl at 0.075 kg ha-1 as post-emergence was found to be the most efficient to control monocot and dicot weeds in soybean which recorded lowest weed density, dry matter (13.94 g m-2) and weed index. The highest seed yield (24.46 q ha-1) and straw yield of soybean and maximum gross return (81500 Abbildung in dieser Leseprobe nicht enthaltenha-1) and net return (56269 Abbildung in dieser Leseprobe nicht enthaltenha-1) were also recorded in imazethapyr at 0.100 kg ha-1 + quizalofop-ethyl at 0.075 kg ha-1 as PoE with highest B : C ratio of 3.23. It was also resulted in the highest uptake of N, P and K by soybean crop and the lowest uptake of these plant nutrients by weed plants (Prachand et al., 2014). Sandil et al. (2015) revealed that stover yield increased with increased application of propaquizafop (62.5 and 75.0 g ha-1 ) doses and imazethapyr (from 50 to 100 g ha-1) and while combined application of propaquizafop + imazethapyr (75 + 100 g ha-1) gave significantly higher stover and grain yield, harvest index, net and gross monetary return than other weed control treatments. A Study conducted at Akola (Maharashtra) and the results indicated that tank mix application of imazethapyr 100 g ha-1 + quizalofop-ethyl 75 g ha-1 recorded significantly lower weed dry weight, maximum weed control efficiency and the lowest weed index and significantly improved the growth characters, yield and yield contributing characters. Herbicides imazethapyr 100 g ha-1 and quizalofop ethyl 75 g ha-1 applied separately were less effective in controlling weeds. The recommended practices one howing and followed by one hand weeding though was at par, but not cost effective (Thakare et al., 2015). Panda et al. (2015) conducted a field experiment at JNKVV, Jabalpur and it was found that post-emergence application of propaquizafop (75 g ha-1) alone curbed only grassy weeds. However, its efficacy was improved when applied in combination with imazethapyr, being higher under propaquizafop + imazethapyr mixture applied at 53 + 80 g ha-1 or higher rate (56 + 85 g ha-1). Yield attributing characters and yield were superior under propaquizafop + imazethapyr mixture applied at 56 + 85 g ha-1 followed by 53 + 80 g ha-1 which was comparable to two hand weedings at 20 and 40 DAS in soybean. In a field experiment at Madhya Pradesh the maximum net monetary return (NMR) was recorded under imazethapyr + imazamox (Abbildung in dieser Leseprobe nicht enthalten18249 ha-1) and WCE was recorded 82.4 per cent in soybean (Parmar et al., 2016). Singh et al. (2016) at Pantnagar (Uttarakhand) recorded that pre-mix combination of imazethapyr + pendimethalin at 1000 g ha-1 in black gram had maximum weed kill efficiency over alone application of herbicides applied as pre or post-emergence. Similarly, the maximum grain yield (1.38 t ha-1) was achieved with pre-mix combination of imazethapyr + pendimethalin at 1000 g ha-1 followed by its lower dose applied at 900 g ha-1 and both doses were found significantly superior over other herbicidal treatments. Supremacy of this treatment was proved by increment of grain yield to the tune of 63.3 per cent over weedy check and only 3.7 per cent lesser than hand weeding (20 and 40 DAS). Pre-mix combination of imazethapyr + pendimethalin also proved to be effective in improving other parameters like plants m-2, pods plant-1, seeds pod-1 and 100-seed weight (g). In a field experiment at Rahuri (Maharashtra), application of pendimethalin PE 0.75 kg ha-1 followed by one hand weeding at 30 DAS and pendimethalin PE 75 g ha-1 followed by tank mix imazethapyr + propaquizafop (80 + 60 g ha-1) at 25 DAS recorded significantly lowest total weed count, weed dry matter and weed index with higher WCE, herbicide efficiency index, crop resistance index and higher soybean grain, straw yield, net returns and B: C ratio. (Nagre et al., 2017). Tomar et al. (2004) in a field experiment in Madhya Pradesh found that application of 0 to 40 kg S ha-1 significantly increased plant height and dry matter accumulation of soybean. Gunjal et al. (2010) revealed that the growth attributes viz., plant height, dry matter and number of root nodules plant-1 in soybean were significantly increased with increased levels of fertilizers application upto to 50 kg N + 75 kg P2O5 + 50 kg K2O + 5 t FYM ha-1. Thakur and Girothia (2010) at Indore reported that application of 39.6 kg P ha-1 significantly increase plant height of soybean (66.1 cm) as compared to recommended levels of 132 kg P ha-1. A field experiment was carried out on clay loam soil of Kota (Rajasthan) having pH 7.5 to find out the effect of different levels of sulphur (0, 10, 20, 30 and 40 kg ha-1) on soybean. Among these, 30 kg S ha-1 significantly increased the number of branches plant-1 from 3.1 (without sulphur) by 29 per cent (Meena et al., 2011). Under temperate conditions of Kashmir valley, soybean plant height increased from 56.1 cm (without sulphur application) by 38.5 per cent when supplied with 30 kg S ha-1 (Najar et al., 2011). On the clay loam soil of Imphal having acidic pH (5.4), application of sulphur at 30 kg ha-1 tended to significantly enhance soybean plant height and branches plant-1 from 45.33 cm and 2.3 (under no sulphur) to 57.27 cm and 4.4, respectively (Devi et al., 2012). In an experiment at Dungarpur, Bairwa et al. (2012) recorded that application of 60 kg P2O5 ha-1 and 45 kg S ha-1 in summer moong bean resulted in significantly higher LAI (2.47 and 2.32) and chlorophyll content (3.01 and 2.94 mg g-1) in leaf at flower initiation and higher dry matter accumulation (8.84 and 8.54 g plant-1) over lower level of P and S, respectively. At Medziphema (Nagaland), Sentimenla et al. (2013) reported that plant growth parameters namely, height, number of leaves and nodules and their dry weight increased significantly with different levels of phosphorus. Application of 25.8 kg P ha-1 recorded maximum plant height of soybean (60.9 cm) which was at par with 17.2 kg P ha-1. At Chitrakoot (U.P. ), Singh and Kushwaha (2013) found that use of chemical fertilizers (100 % NPK) recorded significantly higher number of nodules plant-1 (52.4 and 55.7) in soybean as compared to control. In an experiment at Sehore (Madhya Pradesh. ), Vyas and Khandwe (2013) reported significant response of sulphur application up to 20 kg ha-1and it gave CGR between 45 to 60 DAS (10.94 g m-2 day-1), total chlorophyll content of soybean (2.55 mg g-1 fresh weight) which were 33.7 and 13.3 per cent higher, respectively over control. They further reported that significantly higher value of protein was with 30 kg S ha-1. A greenhouse study with sulphur deficient soil at Ludhiana (Punjab) revealed that the mean dry matter yield increased significantly with application of sulphur up to 13.4 mg S kg−1 at 55 DAS. The mean dry matter yield by applying this treatment increased by 30.3, 56.8 and 52.9 per cent over control (Kumar and Sidhu, 2013). At Bulandshahr, Meerut (U.P. ), application of 40 kg ha-1 sulphur significantly increased dry matter of soybean at 60 and 90 DAS and at harvest compared to other levels of sulphur (Thenua et al., 2014). In an experiment at Jabalpur, Sharma et al. (2014) found the maximum biomass of soybean was recorded with 100 per cent NPKS (20:80:20:20 kg ha-1) and minimum with 50 per cent NPKS levels at 45, 60 DAS and at harvest. Application of 40 kg S ha-1 resulted in significant increase in number of branches and leaf area index of soybean crop at Parbhani (Maharashtra) (Bangar et al., 2014). A three-year field experiment conducted at Ludhiana to study response of soybean to sulphur revealed that increasing level of sulphur from 10 to 30 kg ha-1 produced significantly taller plants (Ram et al., 2014). The height of soybean plants increased from 67.66 cm (under control) to 73.67 cm by applying 20 kg S ha-1 through gypsum on sandy loam soil of Ludhiana having pH 7.7 (Sharma and Sharma, 2014). Based on another field experiment on slightly saline sandy loam soil of New Delhi, low in available sulphur (9.5 ppm), the growth parameters viz. number of branches plant-1 and LAI increased significantly by applying 45 kg S ha-1 in two splits, 50 per cent as basal and 50 per cent at flowering (Lakshman et al., 2015). While assessing the effect of sulphur fertilization at Udaipur, it was found that application of 40 kg S ha-1 to soybean crop recorded 103.98, 10.89 and 7.21 kg ha-1 of N, P and S uptake which was 32.9, 33.1 and 31.3 per cent more than no sulphur application (Dhaker et al., 2015). Sangale and Sonar (2004) in a study at Maharashtra observed that application of sulphur in soybean at increasing level from 0 to 30 kg ha-1 significantly increased seed yield and nutrient uptake. Singh et al (2006 b) at Jarkhand in an experiment on soybean found that application of 60 kg ha-1 S significantly increased seed and straw yield compared to control. On farm testing program in Ujjain (Madhya Pradesh) revealed that the yield of soybean increased by 37 per cent with the application of 20 kg S ha-1 over the farmers practice (Dixit et al., 2009). Mandal et al. (2009) reported that seed yields increased by 72.5 and 98.5 per cent and haulm yields by 56.0 and 94.8 per cent with recommended dose of fertilizer (NPK) and NPK + FYM, respectively over control in soybean. At Coimbatore, application of 30 kg S ha-1 to a sulphur deficient soil resulted in significantly higher pods plant-1, seeds pod-1 and seed index of soybean with concomitant increase in seed yield from 1127 and 1262 (under control) to 1467 and 1534 kg ha-1 during two successive years of study (Vijayapuri et al., 2010). A field experiment was conducted at Agriculture College Farm, Amritsar and it was observed that the maximum plant height of 16.89, 65.78 and 73.37 cm was recorded at 30, 60 and 90 DAS. The highest number of pods plant-1 (80.40) and highest test weight of soybean was recorded in the treatment where 50 per cent recommended N applied through urea + 50 per cent N through FYM +PSB and the lowest of these were found in the control treatment (Koushal and Singh, 2011). Shah et al. 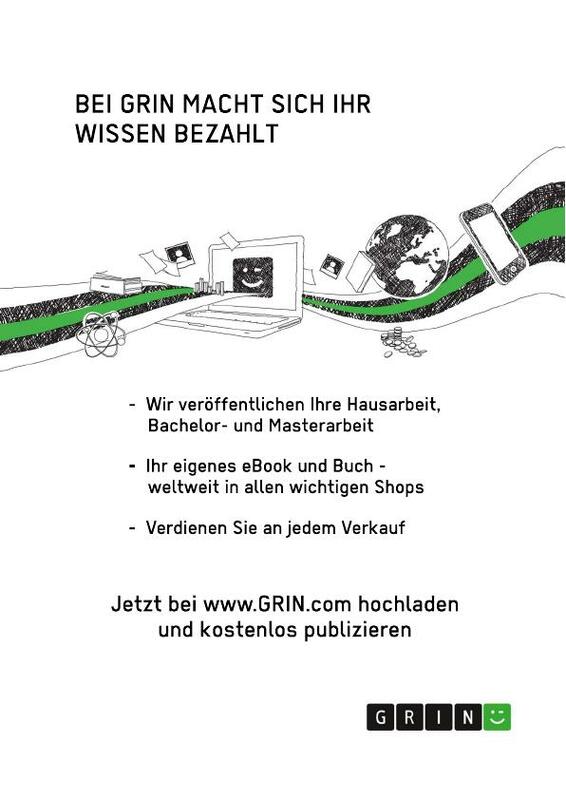 (2012) found that the maximum net return of Abbildung in dieser Leseprobe nicht enthalten20525 ha-1 along with the highest benefit: cost ratio of 3.0 was obtained with the application of 150 per cent recommended dose of fertilizer, while gross income was highest (Abbildung in dieser Leseprobe nicht enthalten31841 ha-1) with the application of 150 per cent recommended dose of fertilizer + 40 kg sulphur + 6.25 kg Zn ha-1 in soybean. In an experiment at Jabalpur, Sharma et al. (2014) found that the seed and straw yield of soybean gradualy deceased with decrease in application of NPKS, maximum being with 100 per cent NPKS (1935 kg ha-1 and 2863 kg ha-1) and minimum with 50 per cent NPKS (1273 kg ha-1 and 1895 kg ha-1). The B:C ratio was also higher with 100 per cent NPKS (1.82) as compared to 50 per cent NPKS (1.16). A field experiment conducted on Vertisol of Parbhani (Maharashtra), deficient in sulphur (9.61 mg kg-1), showed that in comparison to no sulphur (1965.0 kg ha-1), application of sulphur at 60 kg ha-1 produced significant increase (144.1 per cent) in seed yield of soybean on pooled basis of two years of study (Dhage et al., 2014). Madhavi et al. (2015) conducted a field experiments at ANGRAU’s Agricultural College Farm, Hyderabad during kharif for three years to investigate the effect of sulphur application on yield and its use efficiency by soybean on light soils. Across the years, application of 30 kg S ha-1 in two splits registered significantly higher seed yield. The three years mean data indicated that in comparison to no sulphur (1297 kg ha-1); this treatment gave 24.1 per cent higher yield. While, summarizing the outcome of fifteen field experiments in northern, central and southern regions of Argentinean pampers, it was found that maximum soybean yields were obtained by applying 10-30 kg S ha-1 (Divitoa et al., 2015). At New Delhi, Lakshman et al. (2015) found that application 45 kg S ha-1 in two splits (50 per cent as basal and 50 per cent at flowering) significantly increased pods plant-1, seeds pod-1and seed yield of soybean. Consequently, the seed yield increased from 1.37 and 1.40 t ha-1 (under no sulphur) to 1.84 and 1.96 t ha-1 during two successive years of study. The mean increase in net returns due to this treatment was 53.2 per cent over control. In a field experiment at Udaipur, application of 40 kg S ha-1 gave significantly higher dry matter (41.5 per cent) of soybean plants in comparison to weedy check (15.24 g plant-1). Though, the height of soybean plant decreased by this treatment but the extent was not significant (Dhaker et al., 2015). Sushil et al. (2015) conducted a field experiment at Allahabad (Uttar Pradesh) and observed that application of 100 per cent RDF + vermicompost 1.25 t ha-1 + azotobacter 375 g ha-1 recorded significantly more number of pods plant-1 (24.77), number of seeds pod-1 (14.77), number of seeds plant-1 (342.74), seed yield plant-1 (14.80 g), seed yield (1139 kg ha-1) and 1000 seed weight (42.52 g) of green gram as compared to others treatments. Under the temperate conditions of Kashmir valley, application of 30 kg S ha-1 to soybean crop resulted in 40.0, 13.5, 88.0 and 13.2 kg ha-1 uptake of N, P, K and S uptake by crop which was 67.3, 60.9, 65.1 and 95.8 per cent more than no sulphur application, respectively. Najar et al. (2011) conduacted a field experiment and found that Significantly higher protein content was obtained by applying 20 kg S ha-1 while oil content in seed increased significantly up to 30 kg S ha-1. Shirale et al. (2014) observed significant improvement of soil properties with respect to pH, EC, OC, available NPK and Zn with the application of 100 per cent NPK + FYM 10 Mg ha-1 as compare to all the treatments in soybean. On the soils of Hyderabad having available sulphur status of 9.4 to 10.6 mg kg-1, application of 40 kg S ha-1 resulted in significantly higher S uptake (7.22 kg ha-1) by soybean crop, showing 85.6 per cent hike over control (Madhavi et al., 2015). Aher et al. (2015) evaluated the influence of organic farming practices on soil health and crop performance of soybean [ Glycine max (L). Merrill]. They observed that soil organic carbon (11.3 g kg-1), available N (125 mg kg-1) and P (49.7 mg kg-1) were found to be significantly higher in the plot managed organically, while available K (320.1 mg kg-1) was not significant with respect to chemical and integrated practices which further affect nutrient uptake by crop plant. Shinde et al. (2007) in a field experiment conducted at Akola reported that application of sulphur at 60 kg ha-1 in soybean significantly increased oil (22.34 %) protein (41.54%), grain (4.78 q ha-1) and straw yields (11.03 q ha-1) over control. On the clay loam soil of Dhaka (Bangladesh), application of 40 kg S ha-1 significantly increased soybean protein from 39.08 per cent (with no sulphur application) to 42.18 per cent and oil from 19.41 per cent (with no sulphur application) to 20.53 per cent (20 kg S ha-1) (Farhad et al., 2010). Patel et al. (2014), At Jabalpur, in a long term fertilizer experiment on soybean crop recorded that the maximum protein content of 39.5 per cent and oil content of 19.5 per cent in application of 100 % NPK + FYM + imazethapyr treatment, while the lowest value of protein and oil contents were recorded in control + imazethapyr. In a greenhouse experiment on sulphur deficient soil (available sulphur content of 6.2 mg kg-1 soil), the mean oil content increased significantly with increasing levels of sulfur application up to 13.4 mg S kg−1 and then decreased non-significantly (Kumar and Sidhu, 2013). However, on the acidic (pH 4.5) sandy loan soil of Medziphema (Nagaland), application of 30 kg S ha-1 did not influence the protein and oil content of seeds of soybean crop significantly in comparison to 15 kg S ha-1 (Bhattacharjee et al., 2013). At Parbhani ( Maharashtra ), 0, 20, 30 and 40 kg S ha-1 resulted in 36.81, 37.27, 37.73 and 38.03 per cent protein content in soybean seed (Bangar et al., 2014). On a sulphur deficient soil of Parbhani (Maharashtra), compared to no sulphur (35.26 and 18.35 per cent) the protein and oil content of soybean seeds increased significantly up to 37.80 and 19.23 per cent, respectively by applying 60 kg S ha-1 (Dhage et al., 2014). Significant increase in protein and oil content of soybean was observed at New Delhi by applying 45 kg S ha-1 (Lakshman et al., 2015). Raskar and Bhoi (2002) at Rahuri (Maharashtra) reported significant increase in grain and biological yields of soybean with all the herbicidal treatments including pursuit and pendimethalin over weedy check. They observed no carryover effect of herbicide applied in soybean on yield of successive wheat crop. A field studies conducted at Dharwad revealed that post-emergence application of imazethapyr at 75 g ha-1 alone and with hand weeding was most effective in minimizing weed growth and enhancing the grain yield of soybean [ Glycine max (L) Merrill]. Crop phytotoxicity symptoms were not observed in soybean due to application of imazethapyr at 75 g ha-1 (Venkatesha et al., 2008). An experiment was conducted by Das et al. (2012) in West Bengal and observed that application of fenoxaprop, pendimethalin and paraquat with rates (50 g, 1.0 kg and 1.0 kg ha-1, respectively) significantly increased the microbial biomass carbon, nitrogen and phosphorus as compared to weedy check which resulted greater availability of plant nutrients in soil. Pal et al. (2013) conducted a field experiment at BCKV, Kalyani to study the weed control efficiency of herbicide as well as its effect on soil microorganisms including urease enzyme in soybean crop field. The treatment UPH-203 100 g ha-1 + Naacifluorfen 10 per cent SL 206.2 g ha-1 was found best for efficient weed control as well as safe for soil microflora including urease enzyme activity among all the treatments even in comparison to hand weeding treatment. The residual effects of pendimethalin, quizalofop, imazethapyr and imazamox, applied to soybean crop, on the succeeding winter season crops, viz. wheat, barley, spinach, pea, raya, canola and sugarbeet were determined through field bioassay at Ludhiana in 2013-14. Soybean crop tested with fifteen weed control treatments, viz. pendimethalin at 450 g ha-1 as pre-emergence alone and followed by (fb) hoeing, imazethapyr + imazamox at 60 and 70 g ha-1 each at 3 and 4 weeks after sowing (WAS), quizalofop 37.5 and 50.0 g ha-1 at 3 WAS, pendimethalin 450 g ha-1 fb imazethapyr + imazamox 60 and 70 g ha-1 at 4 DAS quizalofop at 37.5and 50.0 g ha-1 at 4 DAS, imazethapyr + imazamox 60 and 70 g ha-1 at 3 DAS fb quizalofop 37.5 g ha-1 at 6 DAS and unsprayed check. The emergence, plant height and dry matter accumulation of all the succeeding crops were similar among herbicidal and unsprayed plots indicating that all the herbicides are safe for raising of these winter crops in rotation with soybean (Yadav and Bhullar, 2014). In a field experiment, imazethapyr was applied at 100 and 200 g ha-1 as post-emergence herbicide in soybean field. Residues of imazethapyr were found in the range of 0.011 to 0.063 μg g-1 in the straw of wheat. However, residual effect in the soil and soybean is very least and recoverable within 80-85 days after its application (Sondhia, 2015). A field experiment at Anand, Gujarat was conducted to study the comparative efficacy of pre- and post-emergence herbicides applied in green gram and their residual effect on succeeding wheat, chickpea and mustard crops. Among herbicidal treatments, pre-emergence application of pendimethalin at 500 g ha-1 or imazethapyr 75 g ha-1 followed by interculturing and hand weeding at 30 DAS proved to be efficient in reducing weed dry weight with more than 70 per cent of weed control efficiency and recorded higher seed and haulm yield of green gram. Further, it was observed that none of the herbicides applied at tested rates had adverse effect on succeeding wheat, chickpea and mustard crops (Patel et al., 2017). On clay loam soil of Udaipur, Mundra (2000) found that application of 100, 125 and 150 per cent NP through fertilizers to maize crop, have no significant effect on seed and straw yield of succeeding wheat. Moreover, at the same location significant improvement in effective tillers, 1000-grain weight and grain yield of succeeding wheat was obtained owing to residual effect of increased levels of phosphorus fertilization in soybean upto 90 kg P2O5 ha-1 but it was at par with 60 kg P2O5 ha-1 (Sharma and Vyas, 2001). Patidar and Mali (2002) conducted a field experiment and reported that application of 75 and 100 per cent RDF in sorghum had a significant residual effect on succeeding wheat crop. There were increased grain ear-1, grain and straw yield of wheat over the control though they were at par with each other. However application of 50 per cent RDF did not show any residual effect on succeeding wheat crop. A field experiment was conducted at Tulsi KVK Ganivan, Chitrakoot (Uttar Pradesh) during 2006-07 and 2007-08 and it was observed that residual effect of organic manures and inorganic fertilizers which were used in previous soybean crop with 100 per cent NPK to wheat significantly increased growth attributes, viz. plant height, plant dry matter and effective tillers meter row length-1 in wheat. Seed (4.94 and 4.95 t ha-1 ) and straw (4.95 and 5.04 t ha-1) yields, net monetary return (Abbildung in dieser Leseprobe nicht enthalten42,479 and 48,213 ha-1) and return rupee invested-1 (Abbildung in dieser Leseprobe nicht enthalten4.57 and 4.48) were osignificantly higher under residual effect of FYM 10 t ha-1 + 50 per cent NPK and direct effect of 100 per cent NPK. Similarly, nutrient uptake in terms of N, P and K were also found maximum under this treatment combination (Singh and Kushwaha, 2013). In two consecutive years (2010-12) studies Jat et al. (2017) observed that the application of the highest dose of nutrients in maize, i.e. 300 : 45.9 : 87.5 N : P : K kg ha-1 resulted in highest organic carbon, macro and micronutrients availability in soil while application of the lowest dose of fertilizer gave significantly higher CEC and available sulphur. The growth and yield attributes of wheat, viz. plant height, effective tillers, spike length, spikelets spike-1 and spike weight in wheat were significantly higher with residual effect of 300: 45.9: 87.5 N : P : K kg ha-1 nutrient application in maize which were on par with 250: 39.9: 75.0 N : P : K kg ha-1. Amongst the direct nutrient application in wheat, significantly higher LCC, SPAD, plant height, effective tillers, spike length, spikelet spike-1, and grain weight spike-1 were recorded with 125 per cent RDF which were on par with RDF or 75 per cent RDF. So, on the basis of two years study it was concluded that growing of maize with 66 000 plants ha-1 and 250:39.9:75 kg ha-1 N: P: K application followed by 90:19.8:24.0 kg ha-1 N: P: K application in wheat may be adopted for higher yield and soil nutrient status in western Indo-gangetic plains. A field experiment entitled on “Effect of Herbicides and Nutrient Management on Productivity of Soybean [ Glycine max (L.) Merrill] and their Residual Effect on Succeeding Wheat (Triticum aestivum L.)” was conducted during in the year 2015-16 and 2016-17 at instructional farm of Rajasthan College of Agriculture, Udaipur. The details of experimental technique, materials used and criteria adopted for treatment evaluation during the course of investigation are presented in this chapter. The experiment was conducted at instructional farm, Rajasthan College of Agriculture, Udaipur. The site is situated at South-Eastern part of Rajasthan at an altitude of 582.17 m above mean sea level with 24º35’ N latitude and 74°42’ E longitude. The region falls under agro-climatic zone IVa “Sub-humid Southern Plain and Aravalli Hills” of Rajasthan. This zone possess a typical sub-tropical climatic conditions characterized by mild winters and moderate summers associated with high relative humidity during the months of July to September. The mean annual rainfall of the region is 637 mm, most of which (80-85 per cent) is contributed by South-West monsoon from July to September. In summers, maximum temperature goes up to 44oC. May and June are the hottest months. Winters are generally rainless and minimum temperature during December and January falls as low as 1ºC. The mean weekly meteorological parameters recorded at Agromet observatory, Rajasthan College of Agriculture, Udaipur during crop periods are presented in Table 3.1 and depicted in Fig.3.1. humidity for the year 2016 were 30.4 to 89.0 and 72.0 to 95.0 per cent, respectively. The evaporation from the USWB class-A pan evaporimeter during the corresponding crop seasons ranged from 2.8 to 9.2 and 1.0 to 5.8 mm day-1, respectively. The sunshine hours during the crop growing season of kharif 2015 ranged from 0.2 to 9.1 hours whereas in kharif 2016 it ranged from 0.5 to 8.8 hours. The rainfall distribution was not normal during crop growing season of 2015 and 2016. During both the years, well distributed rain occurs only in early period of crop growth i.e., 45 to 60 days after sowing but in later growth stages crop faced stress condition. The soil samples were randomly drawn from experimental field up to 15 cm depth before experimentation and a composite sample was prepared and analyzed for different physico-chemical characteristics of the experimental soil. The results of the analysis are presented in Table 3.2 along with the standard methods followed. The soil of experimental field was clay loam in texture and slightly alkaline in reaction and calcareous in nature, medium in available nitrogen, phosphorus, high in potassium and low in sulphur. On the experimental site, wheat crop was taken during preceding rabi season and during summer field was kept fallow before the present experimentation. During the course of investigation, the test crop was soybean and residual effect of used chemicals was studied on succeeding wheat. Soybean variety JS-335 was used as experimental material developed at Sehore (MP) by crossing JS 78-77 x JS 71-05. It is early to medium in maturity (95-100 days) having yield potential of about 25-30 q ha-1. Test weight of the variety ranges from 95-120 g. It has purple flowers with bright yellow seeds and resistant to bacterial pustules and bacterial blight. Details of field operations carried out for soybean are given in Table 3.3. Modular product architecture - Fostering or hindering innovation?